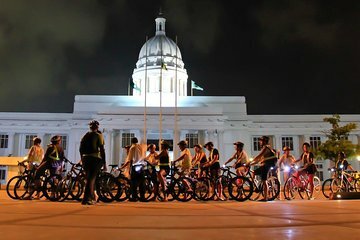 Explore Colombo’s historical streets on two wheels on this private evening cycle tour. Pedal around illuminated squares, landmarks, and parks in the quieter atmosphere of dusk while learning about their history. View Independence Square and Gangaramaya Temple, check out lesser-known colonial-era sights, and visit Galle Face Green, the seafront green originally created by the island's Dutch rulers. Light snacks and refreshments, plus full cycling equipment included. Meet your guide in central Colombo, don your cycling gear, and after a safety briefing, explore the historical streets. Admire Colombo’s landmarks as you hear about their history, and watch the city lights flicker to life as dusk falls. Along the way, break for energy-boosting snacks and refreshments. Start at Independence Square, home to the Independence Memorial Hall, built to commemorate Sri Lanka’s independence in 1948. Note the traditional architecture modeled on Kandy’s royal palace, and continue to Colombo Racecourse, an elegant colonial building converted into a mall. Learn how its grounds were used as a World War II airstrip, and visit Victoria Park, now called Viharamahadevi Park. Pass the elaborate Gangaramaya Temple and restored Dutch Hospital complex of shops and cafes, and check out Slave Island, a district where the Portuguese and Dutch held African slaves. Pause at the Grand Oriental Hotel and Clock Tower Lighthouse, and peep inside the tiny jail cell where Sri Lanka’s last king was incarcerated in 1815. Then, head for Galle Face Green, the seafront park cleared by the Dutch for cannon placements. See the kite-flyers and evening strollers here, and admire the imperious colonial-era Galle Face Hotel before finishing back at Independence Square. We had an excellent night bike riding tour. Guide was exceptional careful with safety. At all times it was explained to us what was happening and what to expect on the road. The places we visited were interesting and our guides knowledge was outstanding. The tour did run a little over time - but that was because it was jammed packed with information. Highly recommend.